Today it’s Moroccan Couscous recipe here at my blog! When I first came across a couscous recipe in one of the magazines I was intrigued as to what was this tiny ball like thingy? Where would I get it? How it would taste? Will I like it? If you too are new to this exotic ingredient and wondering what is couscous and and how to cook it, you are in the right place! Did you know that it’s not a grain, though it looks like millet, or a seed because it looks like quinoa, but in fact it’s a type of pasta, which is a staple food in the North African cuisine!? To know more about cous cous, read on here. Like any other pasta, whole wheat couscous is also available these days. These days the Western grocery stores are stocked up with instant variety of this pasta, making couscous cooking a breeze. Simply take 1.5 times of water and boil it. So to cook a cup of couscous, take one and half a cup of water and bring it to a boil. Add about 1/4 teaspoon of salt and little fat, either in the form of oil or butter. This helps to keep the couscous to stay fluffy and not sticky. Once the water comes to a boil, add the couscous, remove the pot from the stove and cover it with a lid. Leave it for 10 minutes and then fluff it with a fork and use it in any recipe. How to make Moroccan Couscous? Now moving on to the Moroccan couscous recipe. As I have mentioned before, couscous is in the North African region is like rice for us Indians. You can find a variety of recipes using couscous in the cuisines there and the Moroccan couscous variation is a very popular one. I have made it vegetarian omitting the meat and added some soy chunks to up the protein value. Extra-firm tofu is another meat alternate that you can use, but be sure to use only organic if using soy products. You can also use your choice of vegetables to give an unique take and make your own version. Loaded with vegetables and seasoned with spice and herbs, this Moroccan couscous recipe is a wholesome, healthy and flavorful dish that everyone will love. In a medium size sauce pan pour 3/4th cup of water and let it boil. Once the water is boiling, switch off the stove and remove the pan from the stove and set aside. Now add 2 drops of oil, pinch of salt and the couscous; stir it with a fork and close the pan with a lid. Cook the soy chunks/nuggets as per the package instructions. (In a medium pan add about 4 cups of water and let it boil. Once it boils, switch off the stove, add a teaspoon of salt and the soy chunks and leave it aside for 15 minutes. Then drain the water and squeeze out the excess water from the soy chunks and keep it ready). The soy chunks will be very hot, so pour some cold water and leave it for sometime before squeezing. In a large skillet add the oil. When the oil is hot enough add the cumin seeds and let it crackle. Then add the sliced onions and a pinch of salt. Fry the onions and then add the cut peppers and the seasonings. Also include the soy chunks and sautee it a couple of times. 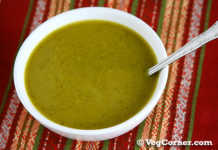 Now depending on the size of the pan you are using add 1/2 to 3/4 cup of water to the vegetable mixture and let it cook. 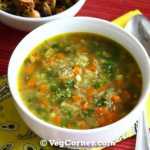 The water should be absorbed and the vegetables should also be cooked. Now add the cooked couscous to the vegetables and mix it well. Drizzle few drops of lemon juice, cilantro and mix it once again. I used soy chunks to substitute the beef in the original recipe. Other protein alternatives can be soy nuggets, chickpeas or even tofu. I have used three color bell peppers because I had it, but you can use just one too. Previous RecipeEgglessCooking.com on Fox News! Couscous is something I cook often.I add chickpeas sometimes I add fava beans too!! The Moroccan couscous looks delicious! Love all those colors in there and nice idea to add soy chunks for some protein muscle. I love couscous.Its very quick and easy. 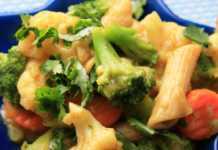 Love the way you used garam masala and veggies. Couscous is one of the things that I keep thinking I should cook at home sometime but have never got around to it. And your kid liked it too? Added incentive for me to try this soon 🙂 Looks great, Madhu! I love couscous, & make it pretty often. 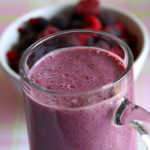 What a colorful healthy treat madhu. hi madhu, with ur inspiration, seeing ur blog all the time as it comes in my dashboard 🙂 i tried a eggless cake and it turned out well i still haven’t posted it, when you have time please visit my blog and see what alterations i need to do with that, everybody in the house liked it! will try some more of this type 🙄 , comming to couscous, i started liking couscous i just make it like a uppma with lot of vegetables in it, but never tried the way you have done it with garam masala & soya, as couscous itself is a very healthy dish you have made it more protein rich by adding soya!, must try it next time and will write to u. The picture looks absolutely fab and yum…..
Sure Jayasri, will check it out. Thanks. Ah yes, nice..I made this recently too. The soy chunks is a good addition thouhg I prefer the smaller ones. 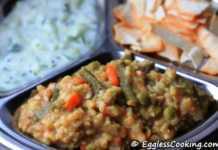 WOw i love couscous, using soyachunks seems a delectable twist Madhu..thanks for sending this delicious couscous to AFAM!! Looks too good. Have some couscous to finish. 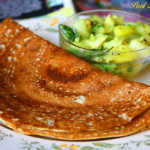 Will try this recip Madhu! BTW – you just blowed more ego into K’s ego! I’ll check yours too DK. Ha..ha..haa! 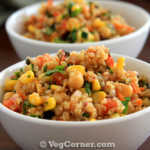 I love couscous and this looks great! Yes Kalai, it’s so easy to prepare and tastes great too. 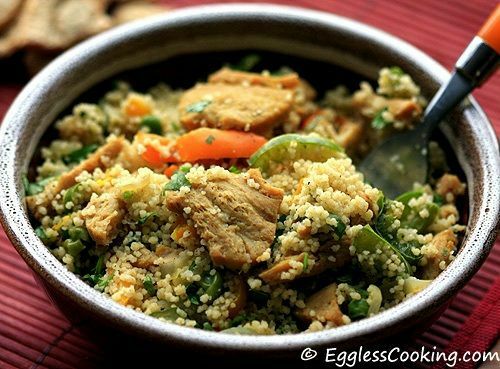 This is a Healthy Couscous dish with all veggies and soy. I love couscous and your look so yumm. When i give couscous to my MIL she tell me she don’t know why we like it so much , she thing it is like sand and then i have to l laugh. Couscous…this thing I heard a lot..but haven’t tried. Looking at pic, will attempt sometime. The dish looks fulfilling, i’ll try out sometime, thanks!! The dish looks yummy and absolutely the kind I would like to try. Bookmarked duly! Thank you! !